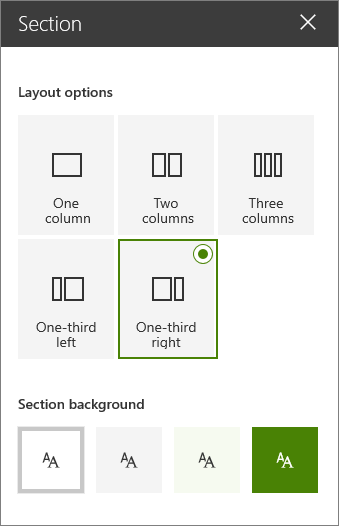 You can add columns to sections within SharePoint modern pages. To show content side-by-side, you can add up to three columns to each section. If you are working on a page that is part of a Communication site, you can create a column that spans the entire page (including its edges), by adding a full-width column. You can also stack multiple sections with varying numbers of columns. 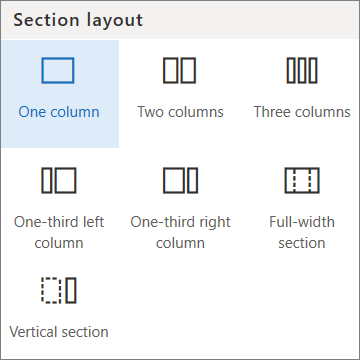 Under Section layout, select the number of columns you want, or, if you are on a page that is part of a Communication site, you can select a full-width column to span the entire page (including its edges). Note: Full-width column is not available on pages that are part of Team sites. It is available only on pages that are part of Communication sites. Go to the page where you want to change a section. In the Section toolbox on the right side, choose the number and type of columns you want, and if you want to make the section stand out, or make your page more attractive, choose a section background color. The available colors are based on your site theme. Note: The section background color shows through most web parts, as in the text web part shown below (on the left). Other web parts maintain the background of the page rather than the section. For accessibility purposes, the List, Document library, and Quick chart web parts will always maintain the page background (an example is the Quick chart web part below). Web parts that will eventually allow section background to show through, but do not today, are: Site activity, Yammer conversations, Yammer highlights, List properties, Page properties, Group calendar, Bing news, and Microsoft Power Apps. For best results, we recommend not using a section background color for sections that contain these web parts.